Restructuring State-owned enterprises (SOEs) and administration of State-owned assets were put at the top of the agenda at a recent State Council executive meeting. With groundbreaking achievements, China heralds continuing progress in this key field. According to statistics provided by the State-owned Assets Supervision and Administration Commission of the State Council (SASAC), SOEs obtained turnover worth 39.6 trillion yuan ($5.99 trillion) from January to October, up 16.3 percent year-on-year, and profits totaling 2.28 trillion yuan ($345.25 billion), up 23.7 percent year-on-year. The figures are the highest in the last five years. Wang Wenbin, vice chairman at SASAC, commented that SOEs, the unshakable backbone of China’s economy, are striding to make continuous improvements in quality, efficiency, and sustainability with more contributions to society. Tax payments by central SOEs added up to 1.8 trillion yuan ($272.2 billion) from January to October, up 3.6 percent year-on-year. Their policy-based fees reductions surpassed 120 billion yuan ($18.15 billion). Efforts to boost employment by SOEs is also noteworthy, reaching 6 million new placements against the backdrop of mass entrepreneurship and innovation. “China’s SOEs went to the top in significant infrastructure, public services, and national defense projects, including manned spaceflight, lunar exploration, deep-sea exploration, high-speed rails, business aircraft, and mobile technology, with world-rate technology and innovation achievements,” said Xiao Yaqing, chairman of SASAC. 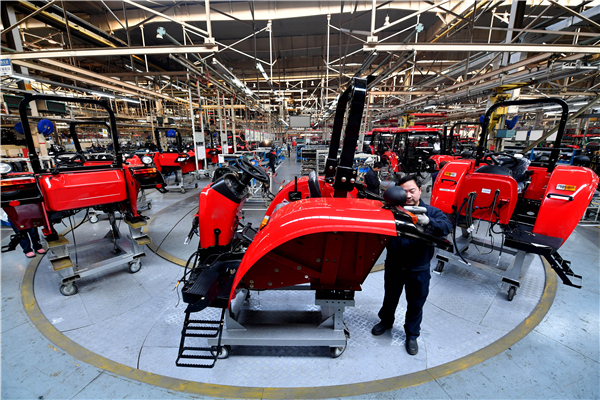 China’s SOE mixed-ownership reform made its entrance in the third term, with 10 subsidiaries to central SOEs and 21 regional SOEs on its list. A survey by the National Development and Reform Commission and SASAC settled problems that arose from pilot projects in the past two terms, featuring deleveraging in supply-side reform. SOE mixed-ownership reform contributed to an optimized SOE capital structure, while deleveraging facilitates development of the real economy, said He Weida, director of the Enterprise Economic Development Institute at the University of Science & Technology Beijing. Despite the ever-expanding scale, central SOEs haven’t rendered their asset-liability ratio out of hand over the past few years, owing to a series of countermeasures taken by SASAC, including tight grips on debt ratios, financial leverage, investment scale, venture management, and financial derivatives, said Wang. It was stressed during the executive meeting that strengthened regulations on overseas assets of SOEs are urgently needed. According to Wang, the central government highly values the overseas State-owned assets, and will intensify supervision on SOEs in overseas investments to prevent losses.